Each month we would like to show you around a different members Range Rover. The vehicle doesn't have to be Concours, as many of them are working vehicles, used regularly, and will show the stresses and strains of good wholesome family use. Very few are exactly the same, as they become personalized by their owners over the years. 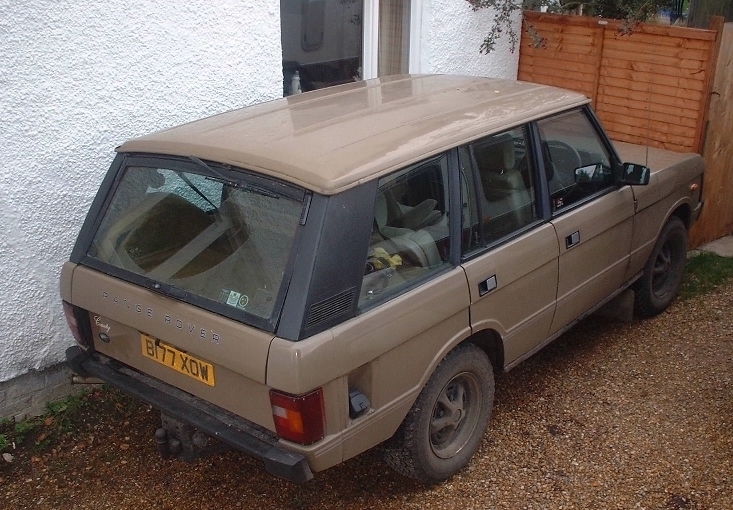 If you would like your Range Rover featured, please send some clear photos or scans of the your vehicle and cover any points of interest. Send them to the Club e mail along with your write up. Above: Rear view, Rostyle Wheels. Interior Front. 1985, when the Efi was introduced. The County was a limited edition. Engine- 3528cc V8- cylinder 16 valve, twin carb OHV. Twin exhaust pipe. Manual choke. Body- Finished in the rare & unusual shade of Arizona Tan. Twin coach stripes. Wheels- Classic Rostyle pressed steel shod with nearly new BRIDGE-STONE Tyres. Seating- Trimmed with Gold check brushed velour upholstery. Arm rests. 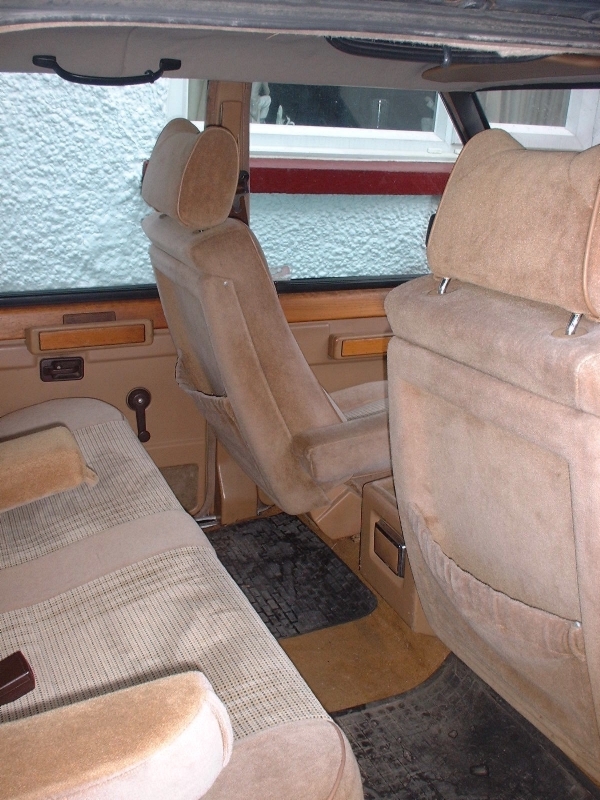 Interior trim- Beige leather cloth with complementary carpeting. Walnut door cappings. Grey leather rimmed steering wheel. Comprehensive instrumentation. Transmission tunnel mounted 'cubby' box trimmed in leather cloth. Front and rear arm rests. Rear head rests. Foot rugs. Rear Map Pockets. Mechanical- Petrol Tank- 18 Gallons imperial. New exhaust system. Power steering. Power brakes. Five speed Manual gear box, with High/low ratio gearing. Permanent four wheel drive & differential locks. Extras- Sony digital surround sound CD player, with a removable face. Towbar with full electric pack. Rear light guards. Alarm/Immobiliser. Central Locking. Tinted windows. Below: Interior Trim, Walnut Door Capping, Interior Rear.